Kudos to all the fellow members of the BM group for successfully completing this edition of Mega Marathon. As promised here is the recap of all the recipes I posted during this Mega Marathon aptly named, the Cooking Carnival! 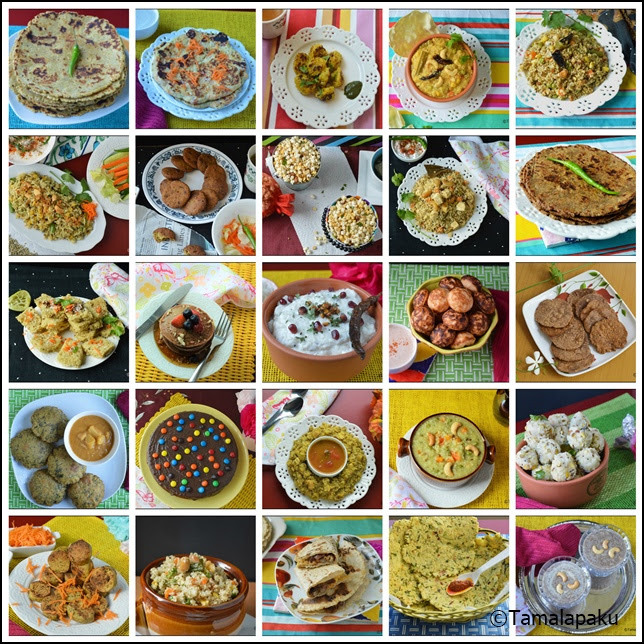 I had chosen to post 26 Millet based recipes and since I had access to Bajra, Ragi, Jowar and Little Millet, I followed them as a pattern and I had fun revealing each and every recipe. In the past I have done a few mega marathons. I shall list them here. Moving on to the posts for this Mega Marathon.. Check out the recaps of all our fellow BMers. Learned so many interesting dishes through u, now i have couple of dishes to make and enjoy at home with this healthy grains.U rocked Harini. Harini, I must say you have a treasure of millet recipes, I hardly include them in our menu but you have motivated me with your skills..truly fantastic. What a great series with millets Harini. I have so many of your dishes bookmarked now -- hopefully I'll get to make them some time soon. Millets are becoming popular again and you picked the apt theme and you rocked with all your 26 recipes. great going. A wonderful collection of millet-based recipes. Amazing roundup. What a feast Harini, I surely learnt and enjoyed so many new dishes..very good choice and what an effort!